(Left) Chef Shaun Brian infuses Parcel 32’s menu with nods to his Caribbean heritage. (Right) A pork chop is served with spicy purple slaw and a heaping dollop of apple-persimmon butter for good measure. Great restaurant design serves as a magnet of sorts. At Parcel 32, festive light bulbs dangle across an open garden patio, luring you off King Street, up a gentle slope paved with encaustic mosaics, past a long joggling board and verdant “plant wall,” across the open threshold, and into a welcoming living room with creamy leather love seats and illuminated wine bottles. To the right, smoky mirrors double the size of a long, cheerful dining room where tufted green velvet banquettes echo the garden foliage outside, giving the space an “outside-in” feel even in winter. To the left, a bustling bar scene stretches street-ward, and glowing oyster shells hang from a custom wrapped chandelier above a community table. The space flows beautifully. That’s quite an achievement, considering Stumphouse architecture firm and interior designer Whitney Rietz had to unify two entirely separate historic buildings into a cohesive floor plan. For 17 years, this hodgepodge of spaces worked as French-Asian restaurant Fish, but Patrick Properties Hospitality Group opted for a makeover. Actually, “makeover” is too weak a word. If you’ve ever seen a time-lapse video of a monarch caterpillar cocooning itself, dissolving, metamorphosing, and emerging as a butterfly, that’s Parcel 32. Helming the kitchen is executive chef Shaun Brian, whose Caribbean sensibilities strike subtle notes throughout Parcel 32’s cuisine. Brian was born on the island of St. John and worked at high-end resorts in the US Virgin Islands, St. John, and St. Thomas, as well as at restaurants in Naples, Florida, and Martha’s Vineyard. At Parcel 32, he embraces the Lowcountry lexicon, riffing on familiar favorites like Carolina Gold rice, field peas, Benton’s bacon, pickled shrimp, hush puppies, and pimento cheese, but in delightfully unexpected ways. 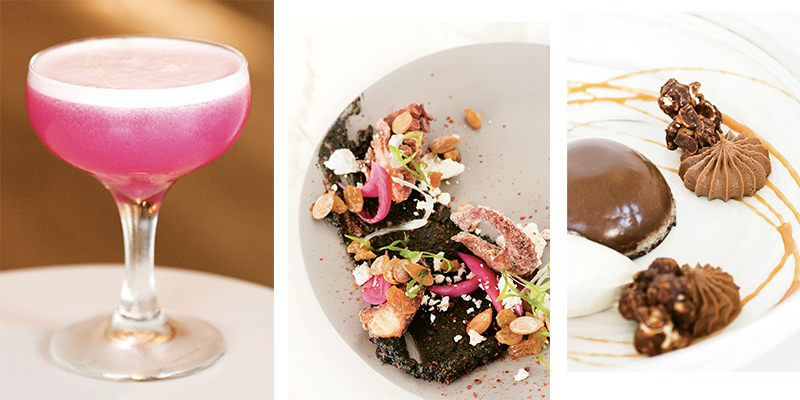 Tickled pink: (left to right) The Pinckney Sour cocktail is a blend of pisco, simple syrup, lemon juice, prickly pear purée, and egg white. Crispy passion fruit turmeric octopus is plated on squid ink purée, while chocolate hazelnut custard is drizzled in ringlets of caramel. My group arrived on a busy weeknight with no reservation but we were graciously “worked in” due to available seating on the second-floor veranda of the house. The music and chatter from the ground-floor dining room floated skyward to our perch overlooking King Street’s nightlife. A huge hanging fern tickled my head as I admired the superstitious “haint blue” of the porch ceiling and mottled brick walls of the old home with its storied past as a bakery and a cobbler’s shop. Thick-crusted bread from Tiller Baking Co. gets a boost from Madagascar vanilla-infused butter with a touch of Bourbon and local Bulls Bay sea salt. You’ll have to fight your dinner date over the butter—it disappears quickly. Plump oysters, fattened in the pristine waters of the ACE Basin, are spritzed with Pernod and lemon then topped with a bloomy-rind Charleston Artisan Cheesehouse brie, all torched to liquid perfection. Hush puppies fashioned from pecan meal are light and airy little orbs with a golden crisp exterior dolloped with pimiento cheese, pickled red peppers, “bacon powder,” and scallions. It’s a warm, addictive starter capable of winning over hush puppy skeptics. Another must is the smoky, chunky, flaky fish spread (a mixture of whatever Mark Marhefka happens to be catching on his boat, Amy Marie) rendered creamy by Duke’s mayo, doused with hot sauce, and served pretention-free on buttery Ritz crackers. Pacing, unfortunately, was slow (on our visit, a 30-minute gap between bread service and appetizers; 25 additional minutes before the arrival of main dishes). I reminded myself that (a) I did not have a reservation, and (b) the restaurant is six months old and still working out its rhythms. Still, there were missteps: a drink menu did not materialize until specifically requested, and our server delivered an incorrect entrée (he remedied the mistake, and a vigilant manager comped us two desserts). I weathered the lags happily by nursing a spicy botanical gin and tonic crafted with cardamom bitters and locally sourced elderflower tonic. Bonus: It goes down smoothly through a biodegradable corn-based straw. Parcel 32 has really done its homework on drinks. Beer and hard cider hail from historic Atlantic trade route “ports of call,” a nod to Colonial and Antebellum days when slaves, rum, sugar, tobacco, spices, and textiles made slow journeys up, down, and across the Atlantic. There’s Caribbean lager on the menu, brewed in Christchurch, Barbados, in homage to Charleston’s first settlers: Englishmen who sailed into the Ashley River in 1670 from Barbados and Bermuda. 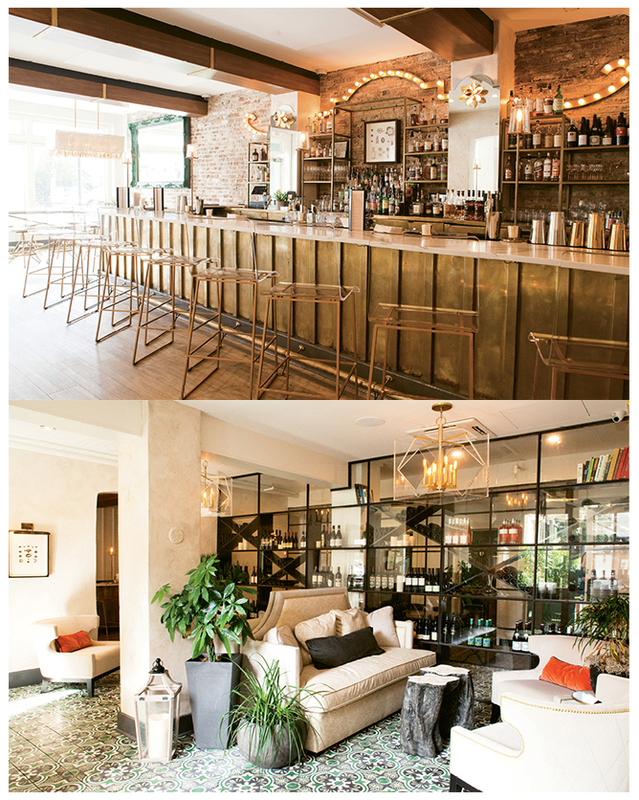 (Top) Metallic accents frame the bar that looks out onto King Street. (Bottom) Stay Awhile: Modern updates like this lounge area have transformed the former Fish space. As such, the chef’s Caribbean roots are a natural fit. Spices and tropical produce weave throughout his menu. Cloves imbue lamb bacon on a salad of hydroponic greens. Cumin and lime jazz up a buttermilk aioli. Cinnamon lingers on braised short rib (so tender as to render a knife utterly unnecessary). Cassava dumplings nestle with mushrooms and pureed truffle root and just the right touch of vinegar beneath the moist dark meat of a broiler hen brined in tea and thyme. Coconut infuses grits made from rice middlins. A hint of pineapple feathers through a creamy “hummingbird cake” over a sliver of spongy banana bread. There’s a timeless synergy between familiar Lowcountry ingredients and Caribbean underpinnings, executed with respect and finesse. With the addition of brunch, I’ll be going back for buttered shrimp hand pies and apple donuts at this hot ticket on King Street.